Why Diy camper van conversion may be an attractive solution for many potential RV-ers? DIY camper van conversion is a small camper that is converted from passenger's or cargo van. Actually, you can convert any large van into a small camper. Maybe you won't have all the amenities as you may have in a full-size camper but if you install some furniture and other gadgets you may transform an ordinary van into a functional camping vehicle for one or two people. Many DIY camper van conversions have some features in common like: a convertible sofa or dedicated bed, sink or tub to wash dishes in, a toilet, a shower with a gray water tank, cabinets for storing stuff, electrical appliances, food and water storage. Some models may have refrigerators, freezers, air conditioners and more. Outside appearance of the DIY camper vans does not change during the conversion work. If you decide to build your own DIY camper van, first you have to choose the appropriate vehicle for the conversion. Passengers' vans are suitable because they are already insulated for the comfort and also have air conditioning already installed. On the other hand, cargo vans are not insulated but they are larger inside. After deciding the van, which you're planning to convert, the next job is the insulation of the ceiling, walls and floors. 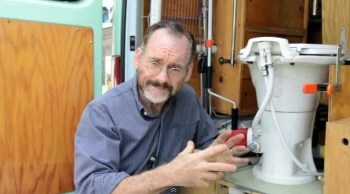 When you're done with the insulation, you must take care of the plumbing which is very essential part of every camper. That's why it is very important to do it regularly. If you are not sure how to do it there are numerous instructions on the Internet and also you can buy some of the plans which will help you do it. The next job is furnishing the van with all the necessary amenities. In order to build your DIY camper van conversion we offer you the tutorial video where the conversion process is explained in details. Ron Tanner converted a Sprinter van into a lovely camper van. 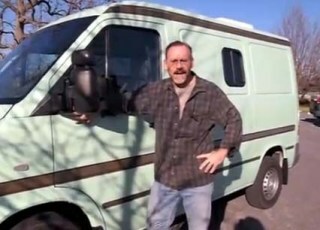 First video is the introduction to the Sprinter van, how much weight the van can carry. Also he explained that this van is very good because it has a huge window in the front which provide you a great view and also is very practical as it is very high, it is almost at the same level as bus drivers. He explained how he put some windows at the back, how he moved the spare tire from underneath the van to the door in order to leave the space for the water tank. Then, he put many extras to the dashboard-some extra lights, USBs for the radio, and for the charging phones, a paper clipper. After that, he explained that the van should be painted correctly and that you should do all the cutouts before the painting to avoid the rust. Then, you will learn how to install the windows on the sides of the van, how to install the hatch for the electrical. You can also improve the appearance of the van by putting the bulbar and fog lights on the front of the van. The next step is insulation. As van has steel walls, they need to be insulated. You'll see in the video that Ron Tanner used sound proofing materials first then a material similar to bubble wrap-it is a reflecting coating that will keep the heat in during cold days and keep the heat out in hot days. Then he put fiberglass insulation. After insulation job, the next step is the plumbing-toilet, sink, drinking water. For this job you will need water tank for fresh water for drinking, black water tank for the sewage and gray water tank for the sink. Also you will need a filt tube, a draw tube and a vent. You will see lot of useful and easy-to follow diagrams. On top of the van, he put the solar panels, inside the vehicle he put a full sized sink, stainless steel kitchen, the fridge, water heaters, two burner stove, gas tank, toilet and full sized folding bed. The Diy camper van conversion is a van has a built in bed, dining area, water storage area and a wardrobe along with cooking area. I recently found out about this type of conversion term. Doing it yourself camper van conversion takes on a completely new meaning when you know what the DIY stands for in nonprofessional’s terms. Take a 1979 or 1980-year van, any year will do for the conversion van. Start by designing your own plans or with purchased plans. Sit down and list everything you will need and make sure to start in the beginning. Do not buy everything at one time, because you might decide a change along the way. When building the van camper do not get discouraged, ask questions of others who might have an idea that you just are not seeing. This helps people adjust plans that may not be exactly what you wanted in the beginning, but work well for the design once you start. Fresh ideas sometimes provides for a solution to a difficult area inside the van. So take a little advice, but always stay on track and listen to your instincts as well. Whether you design the van for camping or just traveling around the country, stop wherever you want to, you can be sure, a self-contained camper van will provide you the space needed to stop at any parks along the way. Although campgrounds are a nice place to meet people, some people prefer to be in the peacefulness of a nice little park area. Travel with a pop up camper trailer or camper van and see all the states, South Carolina, Rhode Island and all the others that have beautiful campgrounds. However, if you have Diy camper van conversion, show it off, your home is your castle.